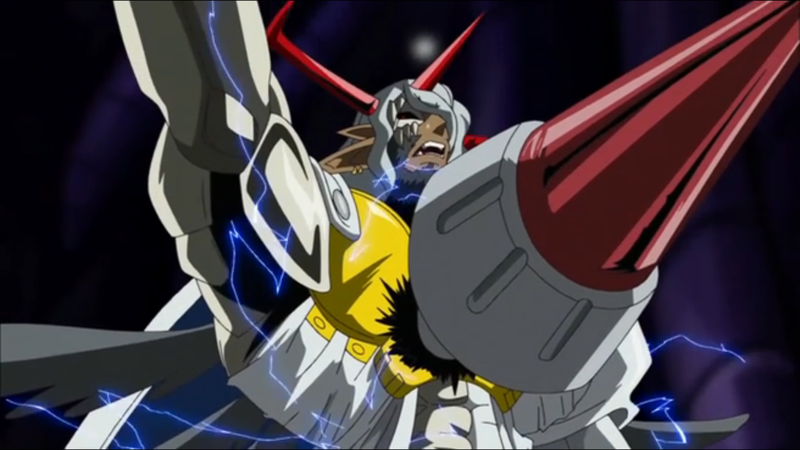 Has there ever been any doubt that AxeKnightmon was a better villain than Bagramon? 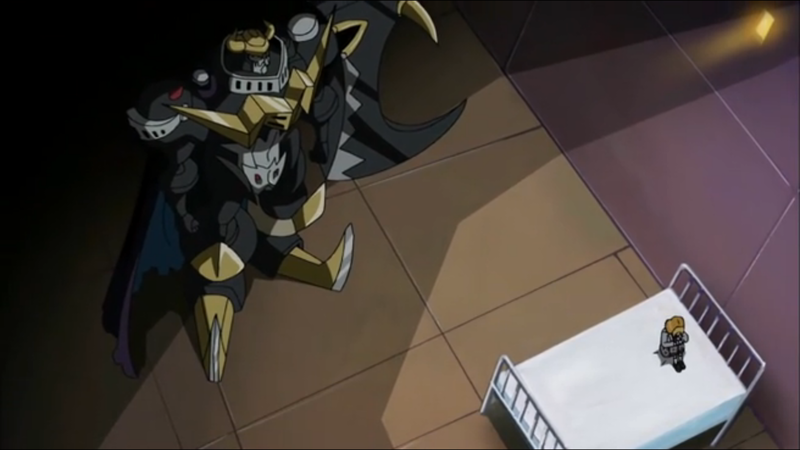 Was there any doubt that AxeKnightmon was going to stab his brother in the back? Bagramon is certainly surprised, but even he recognizes that he really should have seen it coming. Even if Bagramon will eventually seize control again, there's no denying that while he stood at the top and watched everything go his way, AxeKnightmon was far more deliberate in orchestrating his successes. It's ironic that Bagramon is punished for the one virtue that's been celebrated all season, particularly last episode- trust. Even from the earliest days of the code crown wars, he was never involved directly, counting on his three generals to conquer the zones in his name. Whether it was through strong leadership, inspiration or brute intimidation, his army was unified under his command, and he had to put his trust in characters that weren't exactly paragons of honesty. His control of the Dark Generals was much the same way, counting on none of the seven to make a foolish attempt at his power. It's doubtful that Apollomon was the only one who considered it. AxeKnightmon, meanwhile, had no fear of going on the front lines to do the dirty work himself. He didn't have Bagramon's network, but he did have the concept for the Darkness Loader. As he manipulated Ewan and Nene into powering that sucker up, he had to get involved personally, especially once Nene turned. Actually, AxeKnightmon has been a master of reacting to events, even if they don't favor him. Lose Nene? Double down on Ewan. Bagramon gets the code crowns? Affirm your allegiance to him and offer the Darkness Loader technology as tribute. Ewan learns the truth about the world? Abandon the pretense of him being a general and mine him for power. It's a stretch to think AxeKnightmon's original plan took him to this moment, but it's definitely fair to think he worked it out somewhere along the way. You can't ignore the fact that AxeKnightmon came up with the whole idea of bringing the humans in to begin with. Given the size of Bagramon's power, they would have gotten all the code crowns eventually without human interference, or even with only Mikey in absence of Blue Flare and Nene. By bringing Ewan and Nene to the Digital World, AxeKnightmon added more pawns to the game, even if he wasn't destined to control them the entire way. They become complications that present just another thing that could go wrong for Bagramon. Bagramon seems to summon Christopher just to have one for himself and with only the potential for future strategic value. That didn't turn out so well. So when you think about his actions that way, AxeKnightmon stabbing his brother and forcing a digifuse was obviously going to happen. His level of activity in the past makes us cheer for it. He even has a reason why he waited until the critical moment when Bagramon was finally going to eliminate the remaining Fusion Fighters: he needed a time when Bagramon couldn't counterattack. This is what we wanted to see Mercurymon do to Cherubimon! It's calculated, it's the culmination of an entire season's worth of maneuvering, and it also keeps the Fusion Fighters alive to give the actual good guys a chance to win. Yeah, the Fusion Fighters are in this episode somewhere. They don't do a whole lot other than talk about how they're going to defeat Bagramon before he pummels them with one hand. Then it's mostly reactions about D5 also impacting the human world and Mikey falling into the dungeon he needed to end up in anyway. We see Jeremy and Angie back home, but they don't do anything either. Of course, they're used to that. Talk about a downgrade in living conditions. From the happy “affirming your inner child” suite to the cold prison-like room, Ewan's life hasn't gotten any better. It's hard to tell if AxeKnightmon is refusing to revive Damemon or if he actually can't without reviving a host of other Digimon that would run contrary to Bagramon's plan. Unless he's dead set on turning Ewan into a battery, it would have been in AxeKnightmon's best interest to get him back on board, and a little Phoenix Down action would have helped that effort immensely. Shoutmon wants to be king. Bagramon considers himself an emperor. Nobody's really fighting to lead the Digital World as a constitutional democracy, huh? Long story short, we have another Digimon Emperor. One of the nice bits of continuity is that while we see Jeremy and Angie back in Koto or wherever the dub says they're from- in the background, crews are repairing the damage from the battle between OmniShoutmon and Tactimon. 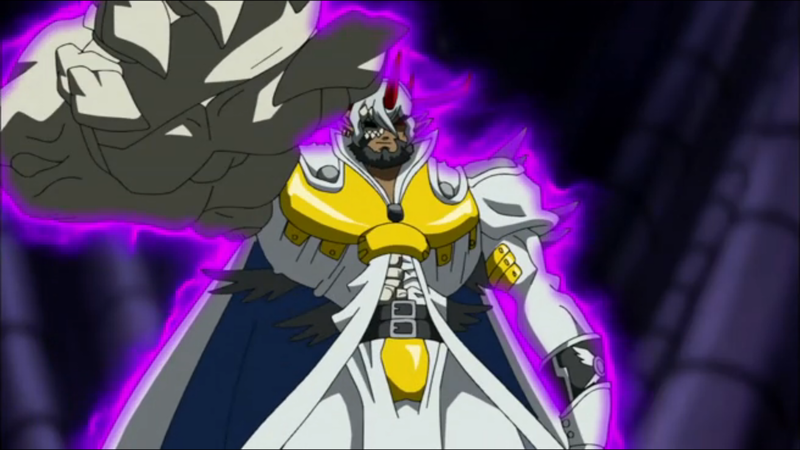 So if AxeKnightmon was always planning to use the Fusion Fighters to distract Lord Bagra (or at least, he was planning it at least since he escaped the Underworld), what was the whole gambit with reviving the Dark Generals? Because that seriously almost succeeded in defeating them. Was he originally going to sick Grand Generamon on Bagra?